Primary Criteria: Community and public service. The Olentangy Rotary Club is part of Rotary International whose principal purposes are vocational service, community service and international service and strives to encourage service participation by youth with this scholarship. We do not require financial information, however, financial need may be considered if you choose to provide such information. The scholarship recipients will receive a scholarship of $1,000 for the first year of study at an accredited two or four year institution of higher learning including technical and other accredited trade schools leading to either an associate or bachelor’s degree. The recipient will be eligible to receive an additional $1,000 for the second year. The deadline for applications is Monday, February 19, 2019. The number of scholarships is not guaranteed in advance and is entirely dependent on the applicants’ qualifications in any given scholarship year in the sole judgment of the Olentangy Rotary Club. 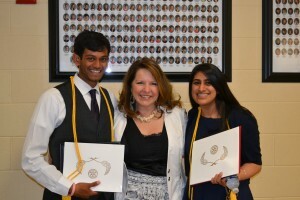 2013 Scholarship winners are Hemanth Koralla (left) and Mansi Arora (right). Olentangy Rotary Club Scholarship Committee chair Jennifer Carney is pictured in the middle. Completed application and supporting documentation in hard copy must be submitted to Ms. Angela Rafey in the Liberty High School Guidance Office no later than Monday, February 18, 2019. Official Transcript: The guidance department of your school will attach your official transcript. Finalists will be selected for interviews to be held in April. All applicants will be notified by mail of their status after scholarship decisions are final. The scholarships will be presented at the senior Awards Program. If you have any problems or questions, you may send an email to Jennifer Carney at jcarney@carneyranker.com or leave a message at 614-579-4046.